Dr. Lawrence's major medical practice focuses on Neonatology and Clinical Toxicology. Dr. Ruth A. Lawrence, MD, is a graduate of Antioch College and the University of Rochester School of Medicine and Dentistry, is a pediatrician, clinical toxicologist, and neonatologist. She is Professor of Pediatrics and Obstetrics and Gynecology at the University of Rochester School of Medicine and Medical Director of the Ruth A.
Lawernce Poison and Drug Information Center and of the Breastfeeding and Human Lactation Study Center. She became the Director of the Poison Center at the University of Rochester in 1958 following its founding as the second center in the country in 1954 at the request of the New York State Health Department. Dr. Charles Lobeck was the first director. It was the first center to answer calls from the public. In the 1960's, with Dr. Robert J. Haggerty, Chair of the Department of Pediatrics and former Director of the Boston Poison Center, she wrote on the management of household poisonings. Plants and herbs are Dr. Lawrence's special interest in toxicology as well as questions of medications during pregnancy and lactation. Dr. Lawrence has served on a number of American Association of Poison Control Centers (AAPCC) committees including the original committee to establish certifying guidelines for centers. 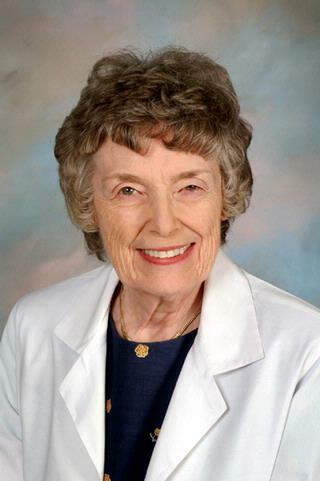 She served on the Board of Directors for the American Academy of Clinical Toxicology for three terms and was Chair of the Committee on Fellowship during that time. When the New York State Department of Health established its consulting committee for poison services, she served as its first chair. She has been a member of the New York State Association of Poison Centers since its founding and has served as its President twice. Dr. Lawrence received the Life Time Achievement Award from the American Academy of Clinical Toxicology in September 2002. Ruth A. Lawrence's focus in neonatal care has been nutrition. Recently that interest has been predominantly in human milk and breastfeeding. Since human lactation has suffered from considerable neglect, a textbook, "Breastfeeding: A Guide for the Medical Profession" now in its7th Edition (2010) has consumed considerable time in researching the current literature and creating a computerized database and developing consensus. Specific research projects have been done in collaboration with Cynthia Howard at RGH. The current funded study involves Vitamin D and its levels in human milk. Breastfeeding mother-infant pairs are recruited to test the impact of high dose Vitamin D (4000 units daily) for the mother on Vitamin D levels in her milk and her baby. They are also followed with densometry. Dr. Lawrence has also been involved in efforts to provide human milk for prematures. A product has been produced exclusively from human milk to be used to supplement a mother's own milk who is feeding a premature. The product was developed in consultation with Dr. Lawrence by Prolacta Bioscience, a human milk bank. The study will be funded by Prolacta. A blinded, randomized study of the supplement will test its impact on the growth of the prematures as well as the incidence of infections compared to breastfeeding prematures who are supplemented with a bovine product. Other work based on clinical toxicology issues and prevention education is funded by HHS grants through Health Resources and Services Administration (HRSA) and carried out at the Poison Center. Dozier AM, Howard CR, Brownell EA, Wissler RN, Glantz JC, Ternullo SR, Thevenet-Morrison KN, Childs CK, Lawrence RA. "Labor epidural anesthesia, obstetric factors and breastfeeding cessation." Maternal and child health journal.. 2013 May 0; 17(4):689-98. Brownell E, Howard CR, Lawrence RA, Dozier AM. "Delayed onset lactogenesis II predicts the cessation of any or exclusive breastfeeding." The Journal of pediatrics.. 2012 Oct 0; 161(4):608-14. Epub 2012 May 09. Lawrence RA. "Breastfeeding--a public health issue, not just a matter of choice." Breastfeeding medicine : the official journal of the Academy of Breastfeeding Medicine.. 2012 Apr 0; 7(2):67-8. Author List: Morton J, Lawrence RA. Author List: Lawrence RA, Lawrence RM.